Warriors of the Red Planet beta was pretty complete and only really needed more art and a better map. Yeah, some editing and more playtesting is always a good thing, and its gotten that. But it was crying out for more princesses! Not of the fairy tale kind, but Space Princesses of course! 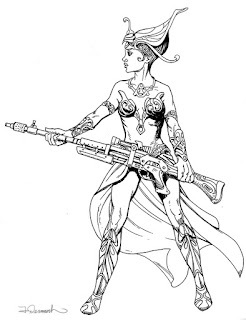 These princesses will carry a blaster into battle with you, help rally a nation against the green hordes, and inspire warriors like John Carter to the ends of Barsoom and back in search of her. So I've been drawing lots of princesses to fill the book with, and here is a small sampling of some of the daring ladies. Not all of them are nice, some will just as soon gut you with their blade or poison you in the dark. Some of them may not even be princesses at all, but are just wearing an illusion to lure you to your doom! A little Warriors of the Red Planet update. A while back I mentioned making some refinements to the map of Mars included in WotRP and then releasing the PDF. Well, as I revisited the book one of the things outstanding that it really needed was more art. Particularly for the creatures section. So I started doing a few new drawings, and then more, and then even more. Eventually I set a goal of having about 1 illustration per spread (2 pages), or more if possible. 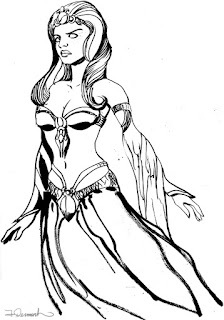 Art takes time, and has delayed the PDF a bit longer. 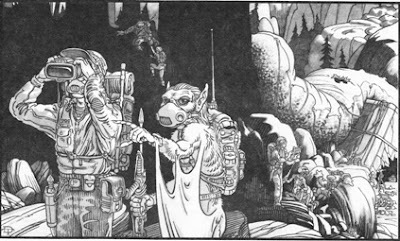 While illustrating the creatures it stood out just how strange creatures in WotRP are! They're pretty fun to draw. When will all this be done? At the rate I've been going it should be this month. Also there is all the feedback to incorporate that I've gotten from players to improve the text (mostly subtle stuff, the Beta is a pretty solid book). In the meantime enjoy this preview. These bizarre entities appear as pulsing, pink brains tottering around on three taloned, birdlike legs. A blowhole at the top of the creature emits small jets of pink, fetid steam when it walks. It tries to incapacitate its victims with its talons before feasting on their personalities and memories. For Warriors of the Red Planet, here is a new drawing of a Caldane and its steed. And the write up of their stats. Unmounted, Caldanes resemble fleshy, goggle-eyed heads that run about on scrabbling crablegs and waving claws. Typically, however, they are mounted on a Caldane Steed (see below), and their statistics will not come into play unless the steed is killed or the Caldane intentionally leaves the creature. Caldanes consider themselves to be the apex of evolution, are fixated on the preeminence of logic, and can fix their gaze upon an intelligent being, controlling it if a save (at +2) is failed. Caldane Steeds look like muscular, headless humans, and are controlled through direct spinal contact with a Caldane rider. A dire stirge’s coloration is dark red with a dirty yellow underside. The proboscis is blood red at the tip, fading to deep satin black at its base. A dire stirge’s body is about 2 foot long, with a wingspan of about 4 feet. It weighs about 2.5 pounds. A dire stirge attacks by landing on a victim, finding a vulnerable spot, and plunging its proboscis into the flesh. If a stirge hits, it uses its powerful clawed feet to latch onto the opponent’s body. An attached stirge is effectively grappling its prey. 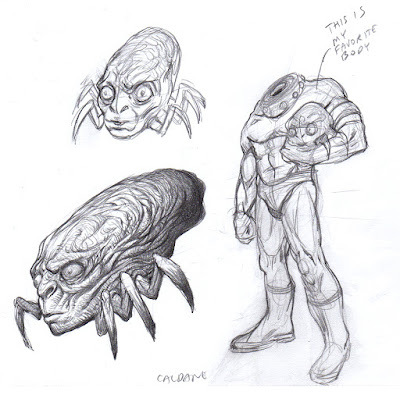 A dire stirge drains blood, dealing 2d4 points of damage in any round when it begins its turn attached to a victim. Once it has its fill (around 8-16hp of damage), it detaches and flies off to digest the meal. If its victim dies before the stirge’s appetite has been sated, the stirge detaches and seeks a new target. A day of rest and eating will replenish half the hit points lost. This is such a cool video. 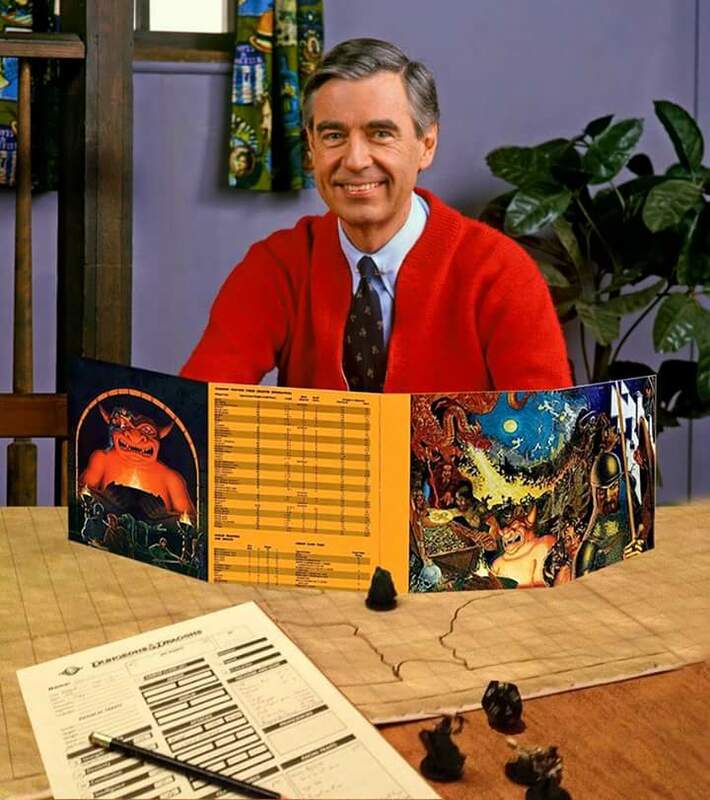 He may seem like a nice guy, but he's a tough DM. 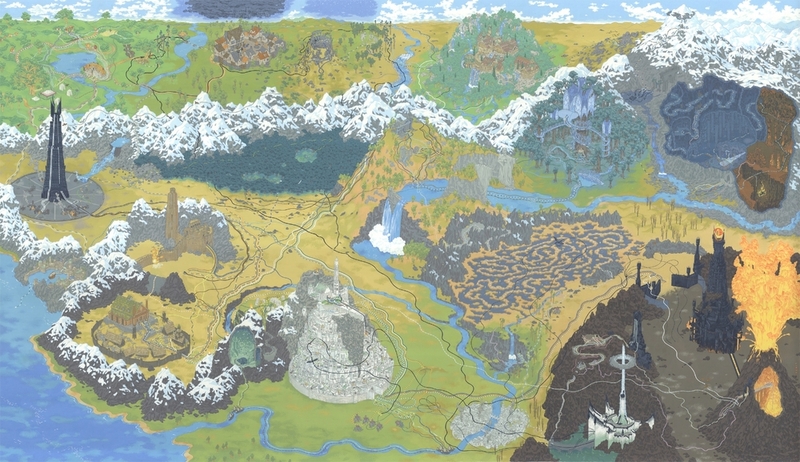 Illustrator and map creator extraordinaire Andrew Degraff has created these compelling Movie Maps detailing out their plots in a visual fashion. The Star Wars and Alien maps are out of this world. Check out this one for Lord of the Rings. When I first saw them I thought they were created digitally, but he has some step-by-steps that show how he paints them in gouache. The map for Goonies looks like a classic dungeon crawl! Classic Star Frontiers art by Dave Trampier. Writing and design are complete. Layout has just been finalized. Now I am working on filling all the spaces in layout with art. Guardians is very near publication. In order to create a compelling super hero world there needs to be lots of heroes and villains for the gamemaster to work with. Using the Guardians rules set several NPC's have been generated for the GM to use in his/her sandbox campaign world with some modification or as is. This NPC, GhostBlood, is a useful character that could be used as an antagonist or as an ally or even as a pre-generated hero character for players to start with immediately. Some notes about the art. I've been studying comics from the mid 70's with some great diligence. This was a time that some truly legendary comics artists were working such as Steve Ditko, John Buscema, and of course Jack Kirby. I've chosen to do some traditional inkwork to emulate the era, and for this post using some halftone filters to simulate the printing from that era. Class Abilities: Assassin, Dark Fighting, Surprise Attack. 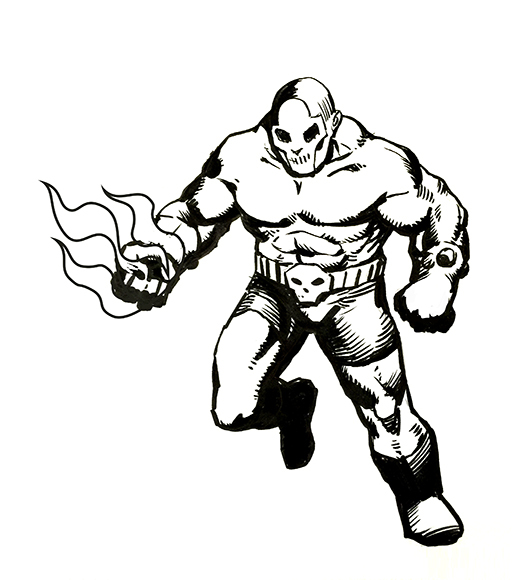 Powers: Projectile Fire, Psychic Weapon, Super Charisma, Super Dexterity, Superior Intangibility, Super Jumping. Features: Danger Sense, Heightened Smell, +2 Wisdom. Gifts: 1 Gadget Point, Paragon. Limits: Bound (serve the Shadow Hounds); Depowered by Holy Symbols and Sanctified Ground. Gadgets: “Shadowcloak” (wearable gadget: Teleport). Equipment: Ballistic body suit, 3 smoke grenades. HP 39. EP 9. AC 21. Ghost Blood is a member of the Wraith Brotherhood, an order of magical assassin/martial artists who walk the path between life and death. He can walk through walls, track like a bloodhound and conjure a psychic sword or fire darts made of his own blood! Alarums & Excursions is a fanzine that started in the mid-70's. Each issue is compiled from articles by a number of individual contributors by Lee Gold who has been running the operation up to this day. It primarily focusses on D&D, but it also has comments, features, notes, and expository on game sessions. Looking back on it from the perspective of 2015 it is like reading a combination Blog + Forum in slow motion. Where the posts and responses are once a month, rather than instantly. It is a truly fascinating piece of gaming history that gives insight on how RPG's were played in the 70's and early 80's. I've put a couple of issues up on eBay for sale, these are from 1982. I've read them to death (and kept them in good condition!) and think its time for them to go to a new home. Hopefully you'll get as much enjoyment out of them as I have. Check them out! 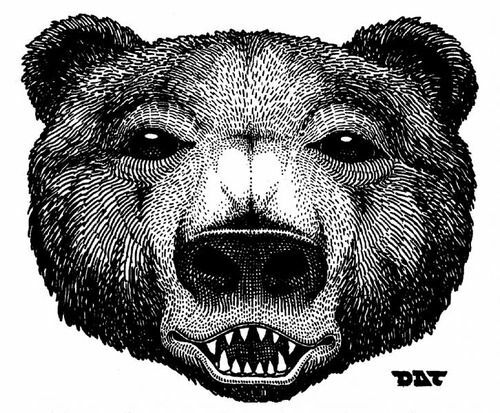 Tramp Tuesday - Werebear in bear form. I haven't posted a mystery map in quite a while. 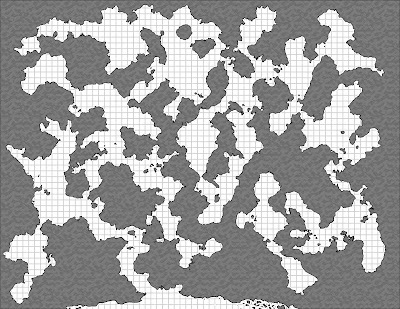 Here I was experimenting with a way to do cool looking caves that would also be useful as a monster's lair, or long forgotten ancient subterranean realm. When I started this map I was thinking of the D1-3 series, in particular how it had the vast unexplored but mostly empty map of the underworld where the DM was expected to fill in with his or her own maps. It really sparked the imagination of what could be down there. I was thinking this is large enough to house under-dwelling creatures like a stronghold of kobolds or troglodytes, but not so large it couldn't be explored in 2-3 game sessions. 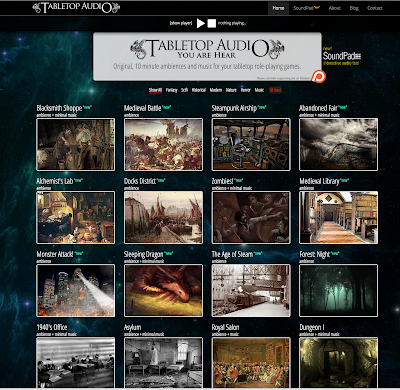 This is a great website that provides audio enhancements for your gaming. Back of the Hall of the Fire Giant King module. While the cover of the Player's Handbook and the illustration of Emirikol the Chaotic get all the glory as Dave Trampier's best work, this one from the original DM's Screen has always been a personal favorite. 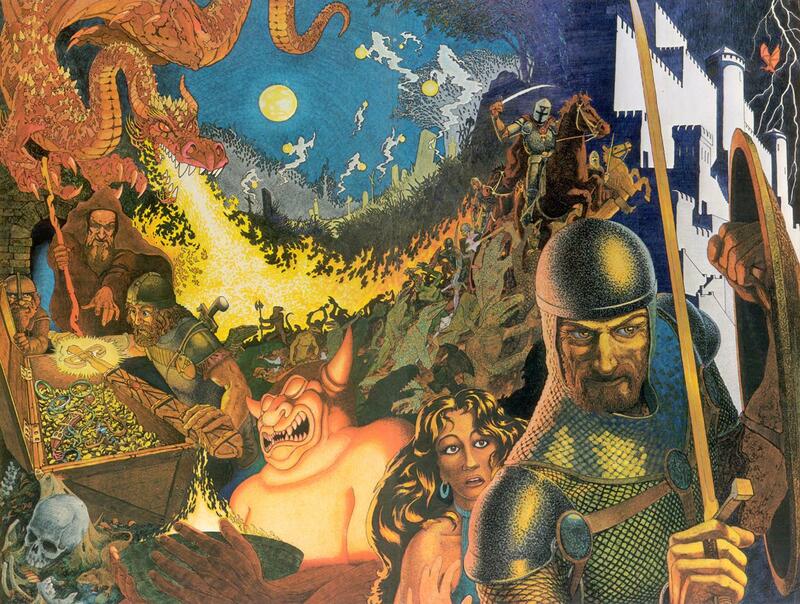 This is a truly epic montage of classic D&D elements. I always liked this guy and I think Timothy Truman did a great job on this drawing. 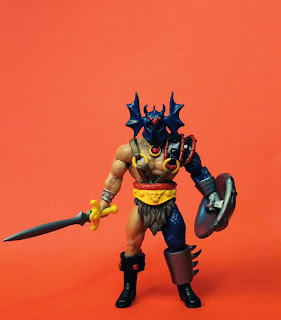 There have been some interesting interpretations of Warduke over the years. 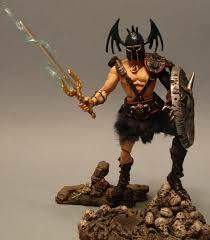 It always seemed to me that this classic painting by Frazetta was in some way an inspiration for Warduke. It can't be all fun and games and cool super powers. What would a super hero be without some serious issues in life to deal with? Also, Issues help to balance out characters a bit. The goal here was not to do a comprehensive "disadvantages" system like in games like GURPS. This is in keeping with the spirit of the original edition with a succinct yet satisfying list of negatives that work against the character. Heroes may suffer from various mundane but troubling issues that confound their existence as much or more than their super powers. Should a character be able to overcome a limit in play the Referee may allow this as a reward for their cleverness, or alternatively eventually replace it with another issue (if overcoming it was too easy). Assign the specified number from the Origins Table. Pick issues or roll d12 on the table below in the correct column to determine the issue. Mutants always take Bad Press as their first issue. Bad Press: One or more major media outlets are on a crusade to destroy the character’s reputation with the public. A hero will have to work extra hard to avoid being smeared a villain, and a villain either is mocked and belittled, or alternatively finds the media urging the authorities and heroes to make their apprehension priority number one. New eBay Auctions - Rules Cyclopedia! I listed some old gaming items on eBay. Including a copy of the Dungeons & Dragons Rules Cyclopedia! It's in pretty good condition, but its time for it to go to a new home. Also the A Game of Thrones roleplaying game. This is the d20 game put out by White Wolf (under their Sword & Sorcery label) quite a while back. 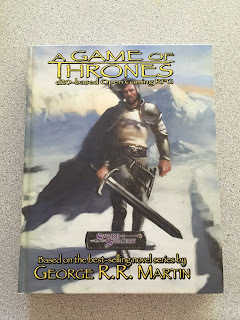 If you love Game of Thrones and D&D you should appreciate this book. It's hefty and full of great info on Westeros. 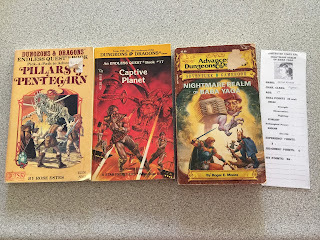 Last, but not least, I'm selling some old Endless Quest books. 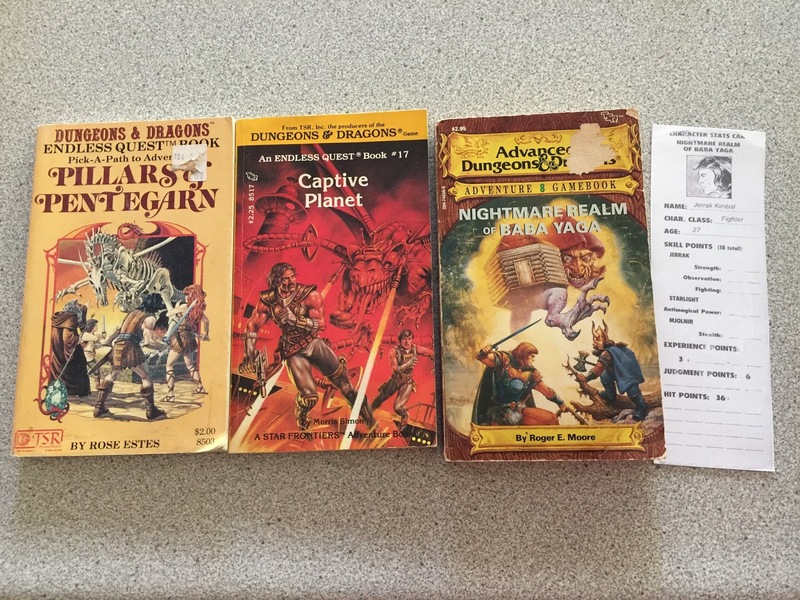 I hope someone can enjoy reading them as much as I did as a kid. Power Wielders are individuals focused on development of their super powers rather than on fighting. As Power Wielders gain experience, they hone their prowess and increase their energy points more quickly than do other classes. Power Wielders are often the best class for characters whose powers work at a distance rather than requiring close combat, or which have non-combat focused powers. A Power Wielder with Constitution 13 or higher receives a bonus of +5% to all experience earned. Power Wielders roll 1d8 for each Hit Die (to a maximum of 12 HD). They start with 3 HD at first level. 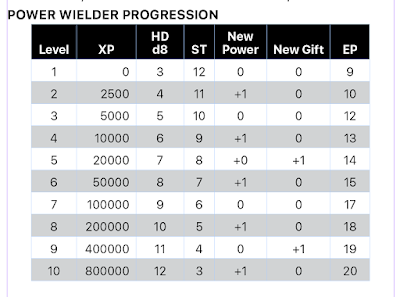 Power Wielders gets a new Power roll every other level, with a new Gift at 5th level and at 9th level. Power Wielders do not use weapons or armor, save for powers built into gadgets they possess. Otherwise they always stick to fighting with their hands, feet, and any powers. During playtesting of Guardians some issues came up regarding using ranged attacks in melee. If you can use them with no penalty, then there is no advantage in taking a melee attack ability. Do you think there should be any penalty for characters who try to use ranged attacks in melee? Like maybe a -2 or something? Just to further distinguish the brawlers from the shooters and give the former a little advantage when the fight gets close? 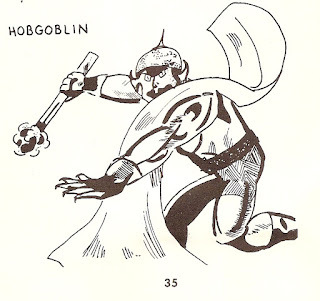 I guess this would come up in the other OSR games too, but while some refs will rule a longbow can't be used in melee, with guns or super powers obviously they can. I admit to being of two minds here; maybe it would make a good "optional house rule" or something. There is a +0 “to-hit” bonus for ranged weapons utilized at short range (x1), a -1 “to-hit” penalty at medium range (x2), and a -2 penalty for long range (x3) attacks. Aiming for one interrupted round adds +1. Ranged weapons have a -2 “to-hit” penalty at point blank or melee range. Aiming, with sights for one interrupted round, adds +2. This post might reveal the most details yet of the Guardians game system. 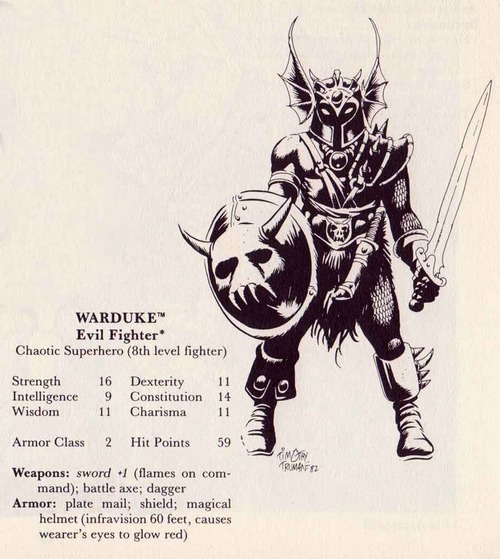 References to Damage Resistance and things like "Charisma Saving Throws" tell you a lot about some of the modifications to ODnD that had to be made in order to make an exceptional super heroes RPG. 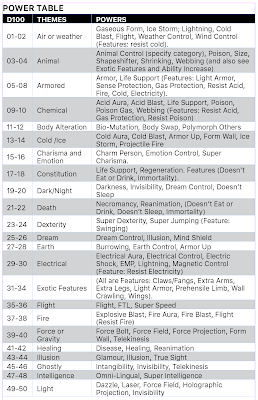 Depending on your character's origins you will be able to roll a number of times on the Power Table to determine what super powers your character has. 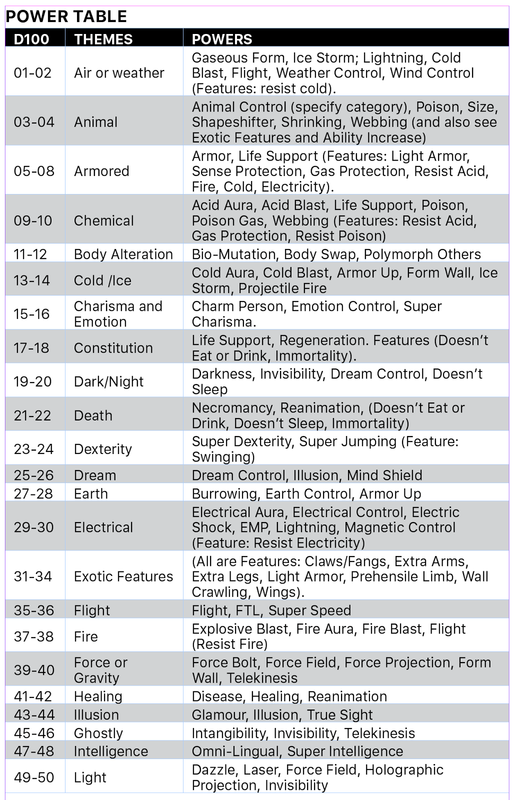 In some ways this is reminiscent of the Gamma World mutations tables and how that endowed characters with unique abilities. Though we've worked hard to make the system much more balanced so the party will all have value to contribute to the adventures without 1 or 2 characters dominating every session because they are so much more powerful than the other characters. While the the die roll determines theme, some flexibility is provided to the players for defining their character by allowing the player to choose a specific power within that theme. Game Masters may allow players to just choose their powers instead of randomly rolling, depending on their campaign. Using a ranged attack, the super can project a stream of corrosive liquid with a 50 ft. range. A hit inflicts 4d6 acid damage. The super can control up to 5 HD of normal animals within 50 ft. Animals that are loyal to a master or fierce resist with a Charisma saving throw; others are automatically affected. Specify either land animals, avians, or marine creatures. Types that fall into two categories (amphibians, etc.) can be controlled by either. Animal control is a minor power if limited to under 5 species. This is the ability to taste an organic substance and instantly perform the equivalent of a full laboratory scientific or genetic analysis on it. The super can also compare two samples, e.g., taste a person’s blood and then determine if a bloodstain is the same person (or a close relative). The super may teleport an object into his or her presence. This causes it to vanish and then instantly reappear within 5 ft., or in the super’s grasp if small enough. The object must be perceived or at a known location within 100 ft. no more than 30 lbs. weight, and not part of something else. The super could (for instance) teleport a pistol or other small gadget out of someone’s hand, but not teleport the heart out of someone’s chest. The super has very tough skin or actual armor. It gives AC 3  or improves another better AC by 2. It gives DR 8 damage reduction (added to other DR). The super can create ultra-strong armor for a brief period, often by forming ice or stone around his or her body, turning the entire body metallic, or reinforcing it with energy. It gives AC 2  or improves another better AC by 2 and gives DR 10 damage reduction (cumulative with other DR). By going into a trance the super’s spirit will leave his or her body. The spirit acts as if it had simultaneously activated Intangibility, Invisibility, and Flight powers but only paying the energy points for a single such power. However, the super’s body is left behind (paralyzed) while his or her spirit is traveling. Astral characters can affect each other normally and while astral can take with them gadgets and costumes, but not other gear. The super’s body drips with acid, radiates cold, burns with fire, crackles with electricity, or buzzes with sound. Anything touching the super while unarmed takes 2d6 cold, fire, electrical, or sonic damage as applicable. If the super touches a foe this can be added to normal unarmed combat damage. In addition the super has an additional DR 4 resistance against that damage type while the power is sustained. In addition any damage attacks of the specified type do +1 damage per die when the super attacks with them. The super can curse someone with bad luck. Range is 50 ft. If they fail a Charisma saving roll they will be at -2 on all attack and saving throws, and are +2 to be hit. The effect lasts 1d6 turns. The Referee can also have ill fortune happen to them. In Guardians super powers fall into various categories depending on how they are used, how long they are in effect, and what action is required to bring the power into effect. Energy Points (EP) are the primary resource to activate powers. (I should probably discuss these in detail in a later post). Permanent (P) powers work all the time. Sustained (S) powers can be activated or deactivated when it is a character’s time to act in a round. Sustained/Round (SR) powers are as above but energy must be spent each round. Concentration (C) powers require continuous concentration to use. Extended Effort (EE) powers are touch attacks that require at least four hours of focused effort to maintain. 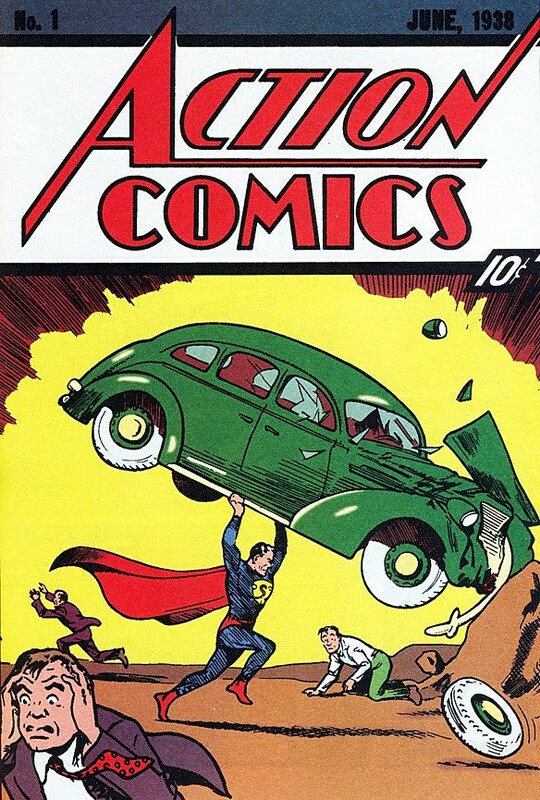 Action (A) powers replace the user’s attack for the round. Ranged Attack (RA) powers are a bolt or projectile like a laser, energy bolt, arrow, or gunshot. Area Attack (AA) powers cover a cone or circular blast radius. Touch Attack (TA) powers requires the user to touch the target. Touch attacks often allow the target a charisma or constitution saving throw to resist. Psychic Attack (PA) powers require the user to simply gaze at or concentrate on the target and pay the required energy points: this is typical of psychic or mystic powers and other exotic attacks. This hits automatically. If a character’s origin indicates he or she has any Gifts roll d100 the number of times their Origin indicates from the Gift Table. Gadgeteers and those with Super-Alien, Robot, or Supernatural origin may ALWAYS opt to take 1 gadget point per Gift instead of a rolling, representing possession of artifacts, inventions, or magic items. Would-be gadgeteers are encouraged to focus on gadget points. * Unavailable when creating sidekicks or henchmen; instead treat as +1 gadget points. ** If this is rolled and the character has any Gifts left, may opt to select Vehicle Ace or Super Vehicle (whichever they don’t have) as the next gift. If the same gift is rolled again, re-roll, with the exception of gadget points which accumulate multiple times or vehicle ace (can be rolled up to four times for each type of ace). 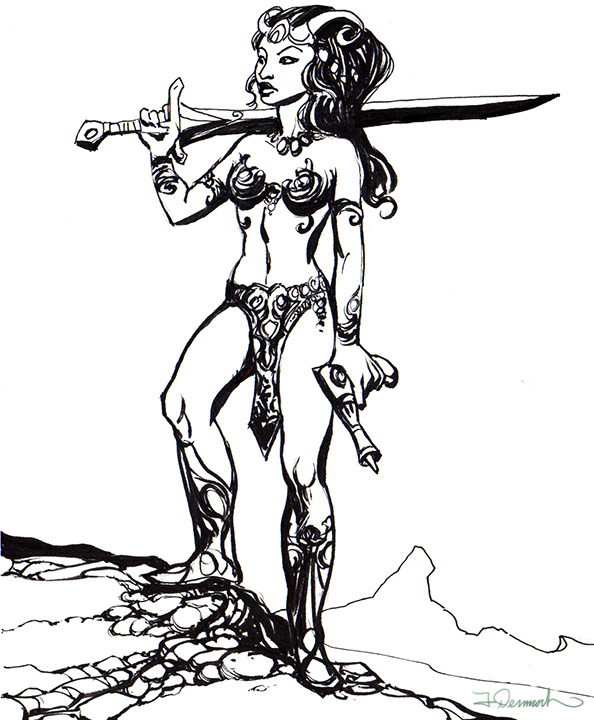 A few years back I attended a workshop by one of the artists who worked on an incarnation of the John Carter movie prior to the Disney version. I got to see a pitch reel of what Kerry Conran (director of Sky Captain and the World of Tomorrow) had planned for his adaptation of Edgar Rice Burrough‘s classic science fiction story Princess of Mars for Paramount. That version was never made, and what we ended up with was Disney’s John Carter, starring Taylor Kitsch which became a box office disaster and generated an inordinate amount of hate for what was an alright, if a bit mediocre movie. Harry Knowles (of Aintitcool.com) was set to produce Conran's adaptation, and he has recently released a high-res version of the pitch reel, it is filled with some fantastic concept art and some interesting CG tests. A low-res version of this video has been around the internet for a while, however this version is sharp and gives a good idea of what Conran's vision for the movie was. Countdown to Guardians. In a super powered roleplaying game sometimes hand to hand unarmed combat is an inevitable situation. One of the weakness of the original edition, which has been the case of all the editions after is unarmed combat. From its wargaming roots which relied on a certain troop type vs. armored foes grappling and unarmed combat hasn't fit into a simple and intuitive system. There have been multiple attempts, a few of which I'm very fond of like in Dragon magazine #83 which had a very good article by Roger Moore "How to finish fights faster" that went a long ways in improving grappling and unarmed combat. 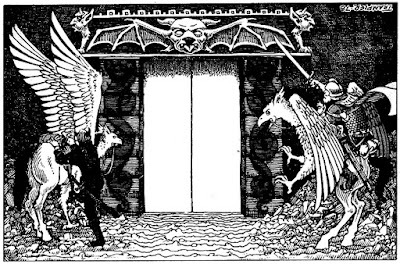 Within the OSR blogosphere I really liked the grappling rules by Douglas Cole and Peter V. Dell'Orto in The Manor Issue #8. We got permission from them to incorporate their grappling rules into Guardians. As we edited, playtested, and refined the rules what we ended up with were something best described as "inspired by" however we want to give full credit to Douglas and Peter for there excellent unarmed combat rules. 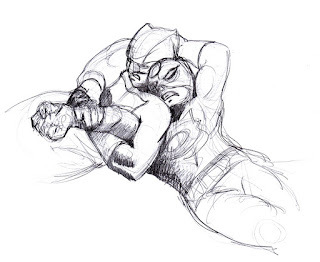 Supers often get into wrestling matches. Instead of treating wrestling as an unarmed combat attack that inflicts hit point damage these advanced rules can be used. A grapple is a melee attack like any other. Roll 1d20, with usual strength Basic Ability Modifier. If you hit, you grappled your opponent. Grappling attacks may be substituted for any appropriate attack one-for-one. Unstoppable (if applicable) may be used. After hitting simply roll damage . . . but all grappling damage is tallied in “Control Points” (CP), not actual hit points lost. Control Point damage is recovered immediately once the attacker lets go (whether willingly or not), not at the usual healing rate. Humans and humanoids do 1d6 CP, plus or minus the usual Strength modifier. For monsters, a grappling attack does the same damage as the base attack being used. The effects suffered when grappled depend on how many CP have been inflicted on you relative to your HP. Once you’ve grabbed a foe, you can develop or discard the grapple. Attacking: You can attack to try to get more CP. Roll to hit normally. If you succeed, roll for CP and add them to the current total. Grappling is cumulative. You can also attack normally with a weapon at no penalty, unless grappled back! Counter-Grappling: You can always grab a foe back! Attack normally and if you hit, roll for CP: though both the to-hit and damage roll may be penalized due to the grapple on n you! You may apply rolled CP to either put CP on your opponent, or reduce the CP your opponent has on you. If the latter, any excess applies as CP to your opponent. Injury: You can attempt to convert your CP to damage. Roll to hit normally for grappling. Instead of inflicting more CP, you may convert your CP to damage: 2 CP turn into 1 HP of “real” damage. However, once you use them for damage, they’re gone. Let Go: You can always Let Go as a free action on your turn. You don’t need to hold on. Throw: If you amassed at least half your foe’s HP in CP, you may spend CP to attempt to throw them to the ground. First “spend” accumulated CP equal to half the foe’s hit points (round up) to attempt the move. Then roll to hit normally, using the new AC penalty, not the old one. 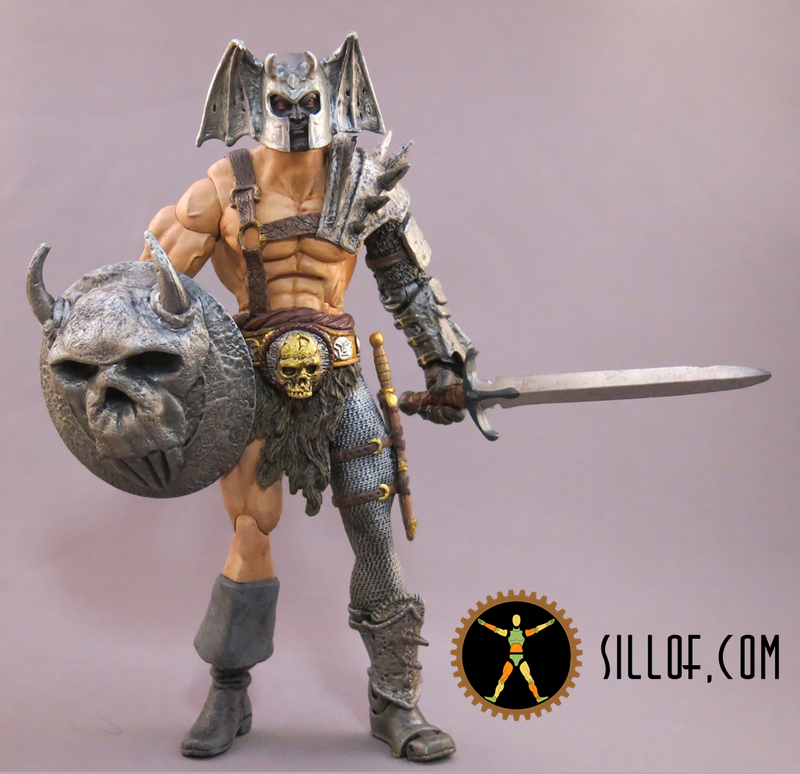 If successful, your foe is stunned for 1d4 turns and takes 1d4 + Strength modifier damage. Grab Item: If you amassed more CP than 1/2 the wielder’s current HP, you can try to grab it. Roll to hit vs. the foe’s armor class as usual. If you succeed, you take it. If the super has a Mental Attack it can be given a different attack mode such as Aura, Bolt, Continuous, Sword (or other melee weapon), or Touch. Countdown to Guardians continues with a preview of the Super-Agent class. Super-Agents are those who overcome challenges through agility, cunning, and stealth, but are good combatants as well, often specializing in weapons or martial arts rather than raw use of powers or physical brawling. This class will often include spies, ninja, cat burglars, elite special ops soldiers, assassins, archers, scouts, and hunters. Although super-agents are a common choice for humans and exotics, their ranks will also include many power-using heroes. Super-agent is a very good choice for those whose powers lend themselves to stealth or warfare. Super-Agent level & XP progression is similar to Thief. Dexterity is an important ability for Super-Agents, those with 13 or higher in the score receive a +5% bonus to all experience earned. Super-Agents roll 1d10 for each Hit Die. They get 3 HD at first level, and one extra die for every additional level, up to a maximum of 12 HD at 10th level. Weapon and Armor Use: Super-Agents may use any weapons or armor. All super-agents have some hand-to-hand training and do d4 instead of 1d3 with a punch. Surprise Attack: A Super-Agent who successfully sneaks up on, surprises, or distracts an enemy receives a bonus of +4 to-hit, and does double the normal damage. Dark Fighting: Even if they have no ability to see in the dark, a Super-Agent suffers half normal penalties (usually -2) when fighting in any degree of darkness, even if it’s pitch black or a Darkness power. This also applies when fighting an Invisible opponent. Skill: Super-Agents have a knack for achieving unlikely results when it comes to things like acrobatics, hacking computers, picking locks, sneaking past or distracting guards, disarming small or intricate traps or alarms, bluffing at gambling, moving silently, maneuvering vehicles, and performing athletic feats in unusual environments (skiing, scuba diving, mountain climbing, etc.). The referee may require an appropriate skill throw to achieve a result that is highly cinematic, while often allowing automatic success otherwise. Combat Specialization: He or she gets one (two if human or exotic) of these combat specialties. An additional one is added at level 4 and at level 8. Archer: +2 to hit and damage when attacking with any archaic bow, crossbow, or slingshot, and when using these weapons get the bruiser’s Unstoppable ability. Flinger: a +2 to hit and damage when attacking with any archaic thrown weapon (knife, shuriken, etc.) and when using these weapons get the bruiser’s Unstoppable ability. Swashbuckler: +1 to hit-and-damage with any archaic melee weapon like swords or clubs, or when fighting unarmed, and whilst attacking with them gain the bruiser’s Unstoppable ability. Gunslinger: +1 to-hit and damage when using any firearms or ranged attacks that do damage and are built into handheld gadgets. 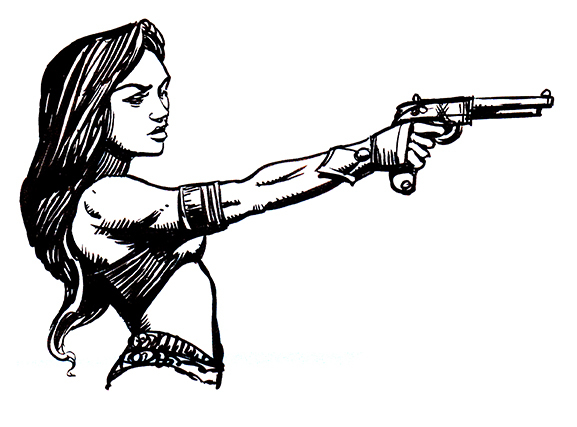 When attacking with an auto pistol or revolver only, also gain the bruiser’s Unstoppable ability. Martial Artist: When attacking unarmed (punch, kick, etc.) 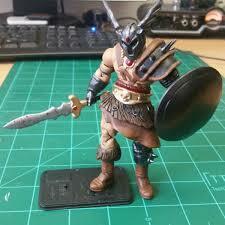 may add +1 to hit, inflict 1d6 instead of the usual 1d4 damage, and gain the bruiser’s Unstoppable ability. If free to move and not wearing armor, improve Armor Class by 2. Assassin: Increases damage bonus of Surprise Attack from x2 to x3. A human or exotic super-agent can take the same specialization TWICE if desired. This doubles the to-hit, damage (or damage bonus) and armor class increase of the character’s chosen combat specialty. Append the word “Super” to the specialization. Thus a human or exotic “Super Martial Artist” fighting unarmed does 2d6 damage, is +2 to hit, and improves Armor Class by 4 when unarmored. Another Guardians preview as the countdown to release continues. Many heroes and villains are Bruisers who excel at battling their opponents and taking punishment without flinching. Although many bruisers rely on hand-to-hand combat, this class is also suitable for supers who use a mix of close and ranged attacks, as well as flyers and speedsters. Strength is an important ability for Bruisers and those with a Strength of 13 or better receive a 5% bonus to all experience earned. Bruisers roll 1d12 for each Hit Die to determine their hit points. They get 3 HD at first level, and roll one extra die every additional level, up to a maximum of 12 HD at 10th level. A bruiser does 1d6 instead of 1d3 when attacking with fists or other blunt body parts. 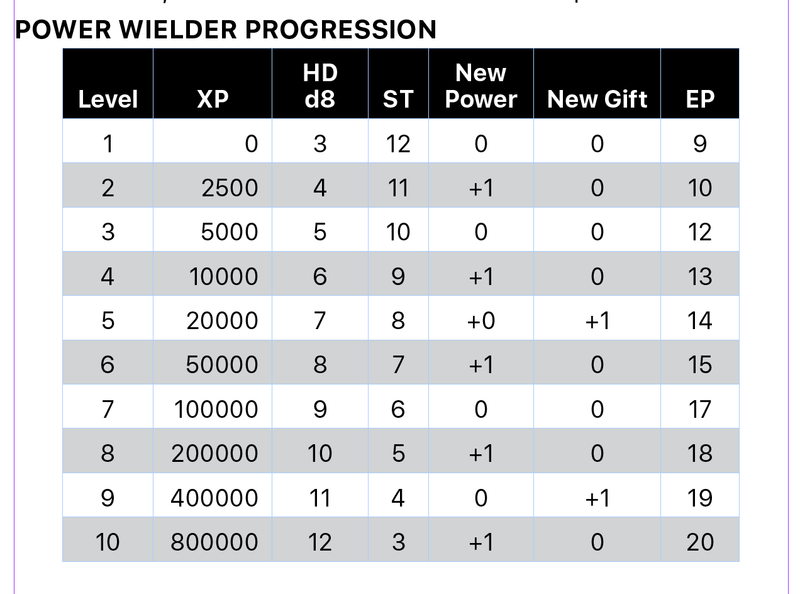 A Bruiser gets a New Power or Gift every 2nd level. Human and exotic bruisers may only add new gifts. Bruisers may utilize two class abilities. Unstoppable: A bruiser incapacitates a foe (reduces them to zero or fewer HP) with a successful attack receives an immediate free attack against another enemy within reach (or range, if using a ranged attack). This does not apply if using attacks or powers that do not require a roll to hit and affect an area. 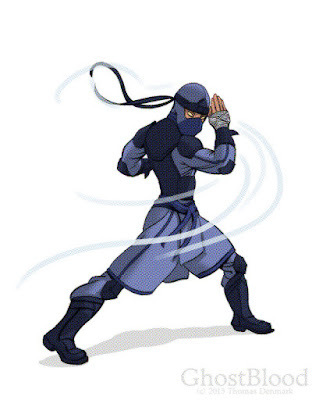 Acrobatic: The character’s fluid fighting style improves his or her Armor Class by two, as long as the character is unarmored (except for any armor built into gadgets) and free to move about. Brawler: The character’s ability to give or take a pounding gives DR 2 damage reduction. Berserk: The character fights with a barely contained battle fury. In any highly stressful situation (referee’s discretion) the character may go berserk and attack enemies or obstacles with an insane rage. To avoid this roll a Charisma saving throw at -4. 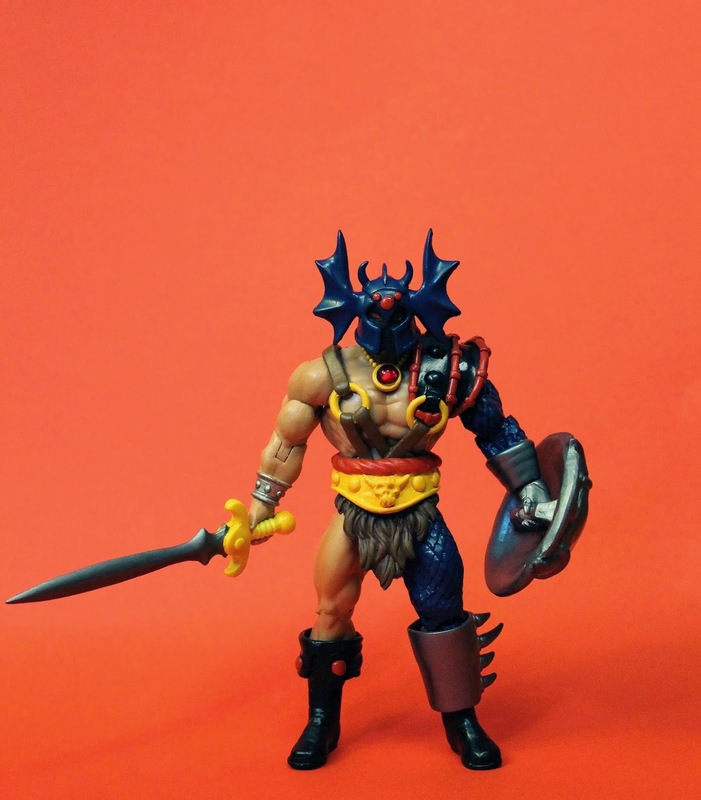 Otherwise, the berserker must charge toward or attack the enemy or obstacle in melee each turn and cannot retreat, surrender, used ranged attacks, or talk coherently until it’s defeated! It costs 1 energy point per round to rage. The berserker cannot stop until the fighting ends or he or she is out of energy! While berserk add +3 to Strength but Armor Class worsens by 2. 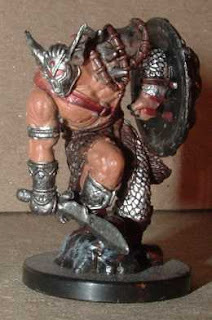 Weapon Wielder: A Bruiser does not usually fight with weapons or use a shield, but with this combat specialty the bruiser may freely carry and use ONE specified weapon e.g., a hammer, whip, sword, shield, etc. Thus, a bruiser could have Weapon Wielder (Hammer). They receive a +1 to hit and damage with this weapon. 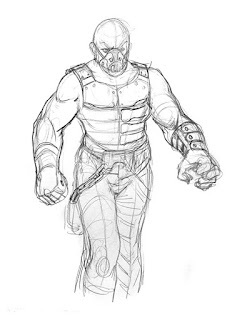 Weapons and Armor: With the exception of powers built into their own gadgets, a bruiser may not wield weapons or use shields unless they have the Weapon Wielder ability and may not wear ordinary armor. 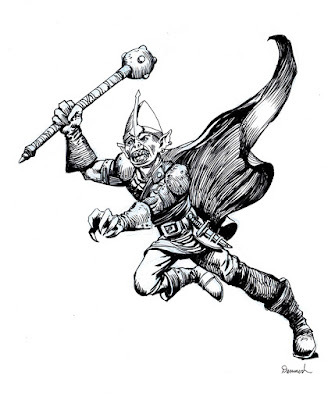 A character may opt to take an additional combat specialty in lieu of a new power or gift. What is more important to a Supers RPG than character creation? The first big question to answer was do we make it a point-buy system or random generation or something else? As development proceeded it became quickly clear that we did not want to do a point system. They too often end up complicated, fiddly, number-crunchy, and cater to the worst aspects of munchkinism. Also, that just wouldn't honor the tradition of the original edition. So character creation does do random ability generation: straight 3d6, and then your Origins and Class would modify the results. Well, your die results will aid you in choosing the best character type to play. How to boil down the huge variety of possible supers into a simple class-based system? The solution to this came about surprisingly well, and is part of the system I am happiest with how it came out. First you choose an origin. This can be Human, Exotic, Mutant, Robot, Cyborg, Super Alien, Supernatural, or Superhuman. The next component to your character is Class. This can be Bruiser, Super-Agent, Power-Weilder, and Gadgeteer. Fighter is included as an NPC class to be used for military, para-military, mooks, or police force units. I'll get into the Classes in another post. For now I want to focus on what the Origins are. In order to explain the differentiation of various Origins I have to talk briefly about how superpowers are handled. There are Gifts like wealth, a super vehicle, or political authority. Then there are Powers, which are like you'd expect weather control, flight, super strength and so on. I'll get into more details later since there are complications to these in the form of Limits and Issues. That's also for another post. Human is, you guessed it, a regular human. Like a Dark Detective Gadgeteer or a gun-wielding Vigilante. They do get an extraordinary bonus to stats to represent that they are at the peak of normal human ability at somethings. 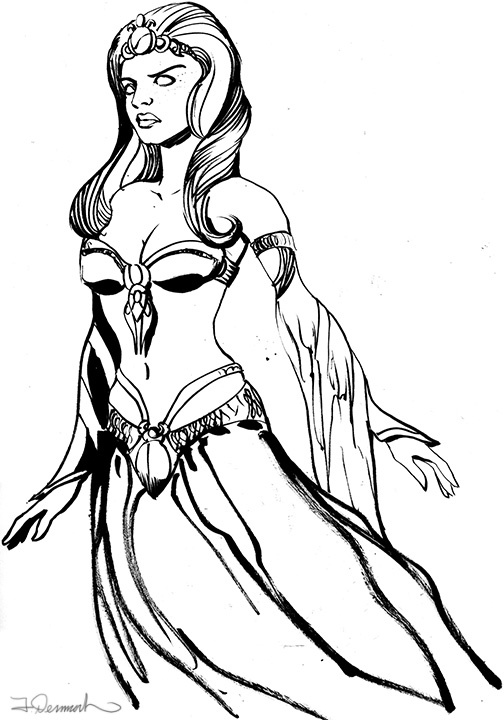 Exotic is similar to human in that they are "normal", but they can be a member of an alien or supernatural race. Perhaps they just have blue skin or pointy ears, or lizard skin. Again, like humans they are in the normal range of abilities, but do get a bonus to put them at the peak end of normal. Humans and Exotics are more likely to have Gifts than Powers. Mutant. It wouldn't be much of a supers RPG without mutants! Would it? Their powers come from their inborn mutant abilities. But they are also feared by the public and so often get bad press. Cyborgs and Robots are quite similar but are different enough to warrant their own categories. Their powers come from mechanical and/or computer abilities and enhancements. Super alien. 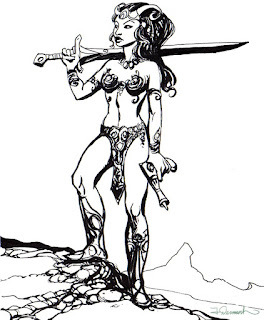 Like John Carter on Mars (the original super! ), some aliens have superpowers when they are on Earth. Supernatural origin. I was hesitant to go too far into mysticism, occult, and magic in Guardians. However, there is a big tradition in comic books to dabble in these as sources of powers so I'd be remiss not to include them. Also, this ties into using other original edition compatible games with Guardians. 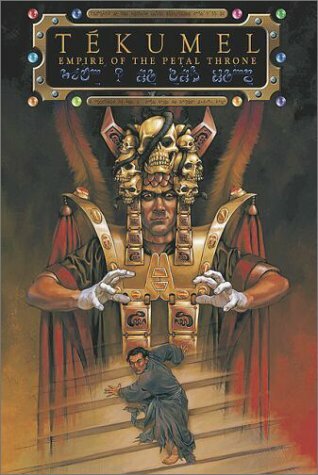 If you wanted a Sorceror Supreme type you could access the thousands of spells that have been designed and use them in your Guardians superhero game. At any rate this covers demons, angels, gods, witches, vampires and so on. Superhuman. This is for your classic super that got her powers from a genetically modified arachnid, or a super serum experiment. I think one of the things that surprised me about co-designing Guardians was how much of the common tropes could be handled in the Origins category, and this allowed for the Classes to be quite simple and streamlined. But, more on that later. 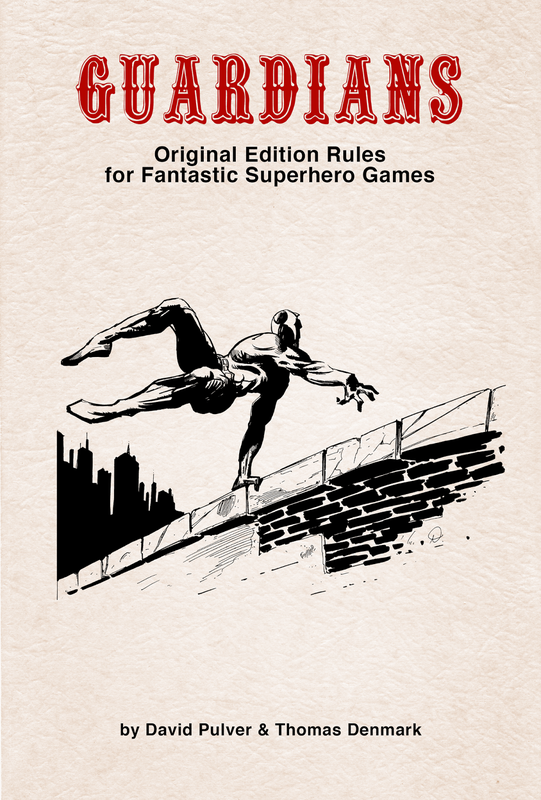 Oh, and here is a great article on the classic Marvel Super Heroes game by TSR. I recently put together a collection of drawings and sketches of done over the past year (or so). It's 28 pages and filled with all kinds of doodles, pencil drawings, pen & inks, and composition studies. I'll have it at the conventions I'm lined up to attend this year, including Wizard World Sacramento, Gen Con, Wizard World Reno & San Jose. Inspired by the hobgoblin drawing from Vol. 1 Men & Magic, here is my attempt at doing an updated version. Brett Slocum took Warriors of the Red Planet and house-ruled it into a Tékumel during The Latter Times game. It is a pretty clever use of the ruleset. He posted the rules on his joyfulsitting blog. 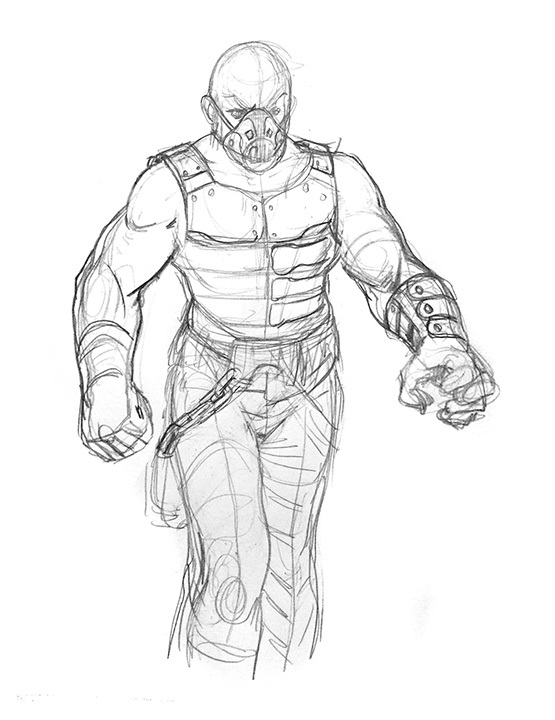 A sample character from Guardians. Str 8 (-1), Dex 13 (+1), Int 15 (+1), Wis 9 (0), Con 10 (0), Cha 13 (+1). AC 9 .HP 13 EP 9. This blog has been mighty quiet so far this year. But that is because I have been hard at work creating some interesting OSR material that will soon be published. The single biggest request has been for a PDF version. And I'm happy to say that the PDF will soon be available. What was the big hangup? Well, I always wanted a decent map of Barsoom to go with the book and the map in the print edition wasn't quite at the level I wanted. So, I've been working on a better more usable map to include in the PDF edition. Also, there has been an adventure in the works which is being finalized now. It has been playtested several times and is ready for a final editing and layout pass. 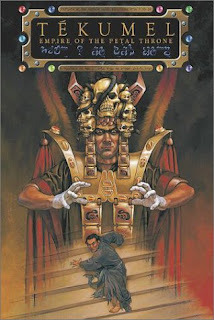 So The Lost Vault of K'Ral is about ready to publish. 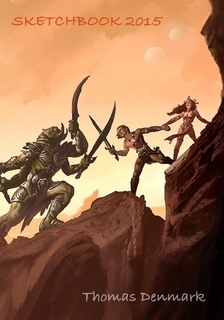 This makes Warriors of the Red Planet a much more satisfying book with a Core Rules, a basic Sandbox setting ("Barsoom"), and an adventure. Now, for the big announcement. I have admired a lot of the books that have come out lately in the tradition of the Original Edition. One of the ones that really caught my eye was White Star by James Spahn. 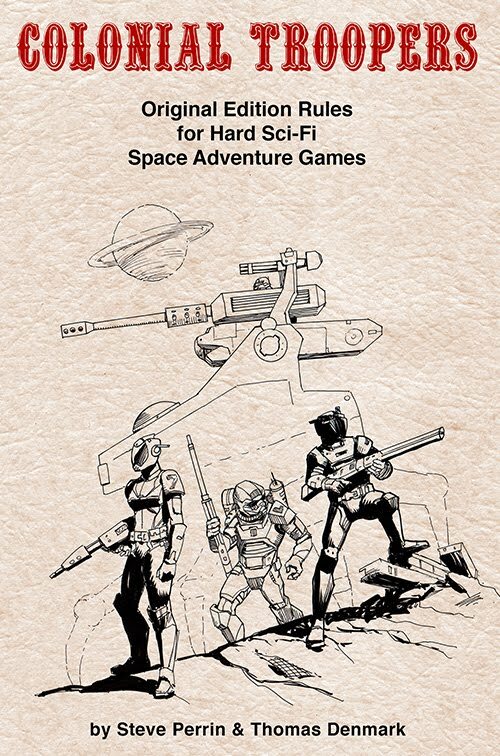 I wanted to do a Star Wars inspired OSR book, but he beat me to the punch! 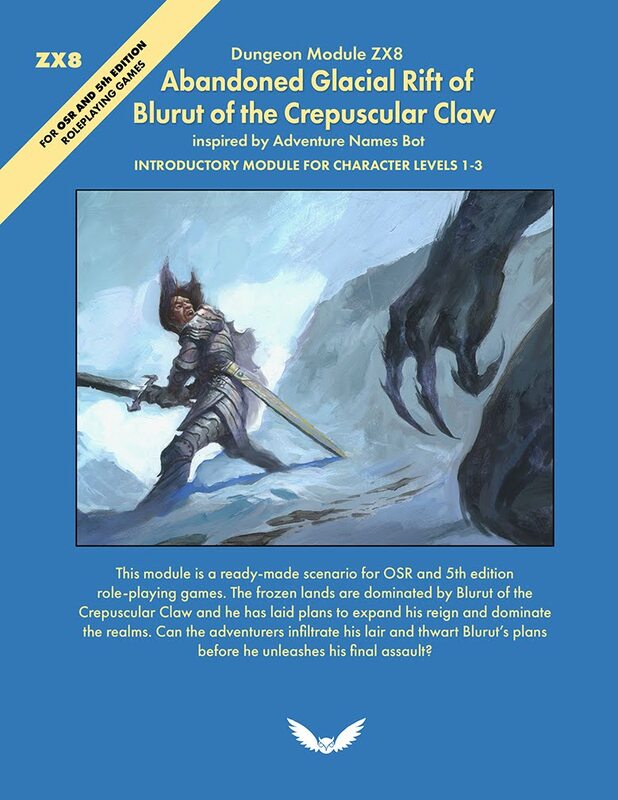 That's okay, because I've been working on another OSR book inspired by the recent spate of amazing comic book movies that have come out recently. Imagine if you will that the original RPG, instead of being Tolkienesque, had been inspired by Silver and Bronze age comics! Introducing GUARDIANS. A new retro-clone that reimagines the original fantasy RPG as a super-powered game of super heroes and super villains in a modern day setting. The writing is complete, and it is currently in layout with art being added and finishing touches being made. 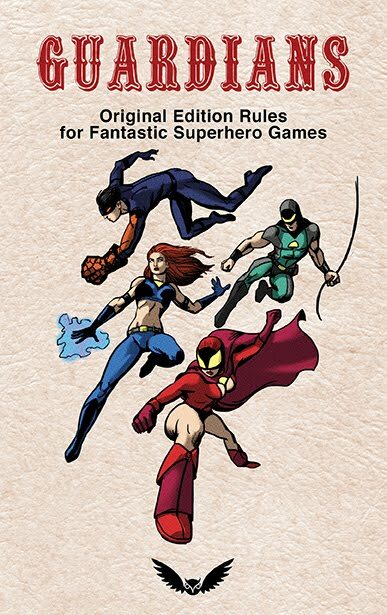 My co-author, David Pulver is a veteran writer of RPG's going all the way back to the classic Marvel Super Heroes by TSR! The final book will be available July 9th by PDF and Print. I will have copies at Gen Con for those attending the show. Expect previews over the next few weeks to discuss the mechanics and how the richness, complexity, and depth of the superhero genre was boiled down to its essence and simplicity for the Original Edition format. Fun spirited RPG podcast Drink Spin Run had a great episode about their favorite (and least favorite) published settings. They mention Warriors of the Red Planet (positively) along with a lot of other entertaining discussions on what they like and don't like in various settings. 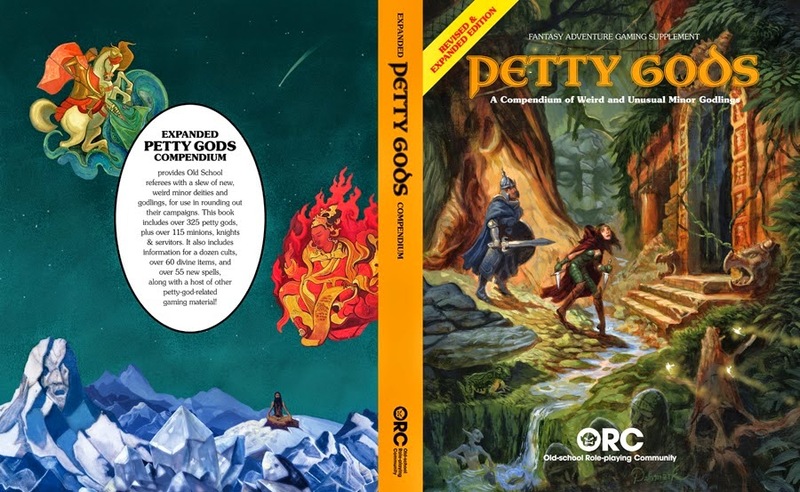 Petty Gods is one of those long in development community projects that has been available in various formats for a while now. At last the revised and expanded version is available in hardcover and softcover formats! And the pdf is free. Head on over and get your own copy. I recommend the hardback, I've gotten other hard cover books from Lulu and have been satisfied with the quality. Free Petty Gods PDF from RPGNow. The PDF has 396 pages cover to cover! It's a really big meaty book. For some time now I have been trying out a system to make more balanced characters. The standard way to create attribute scores is to roll 3d6 in the order listed above. Once those rolls have been made, it is often obvious which type of character best fits the stats, but a player always has the option to play any character class desired. This basic method urges the player to allow the dice to choose what kind of character is played. The Hero has very good stats in two attributes, average to high average in three, and one that is not quite up to the average, portraying the “fatal flaw” that accompanies the story of every hero. The Generalist has a couple of slightly above average abilities, but is at least average in everything. In theory he can be competent as any sort of character. The Specialist is the best there is at what he does, hence the 18 Attribute in something. He also has Heroic level Attributes in two Attributes, high average in a fourth, but two of his Attributes range from low average to poor. This portrays his total concentration on his specialty to the detriment of a fully rounded skill set. Point systems never really feel very "DnD", and I think this system is much quicker and less fiddly anyways. 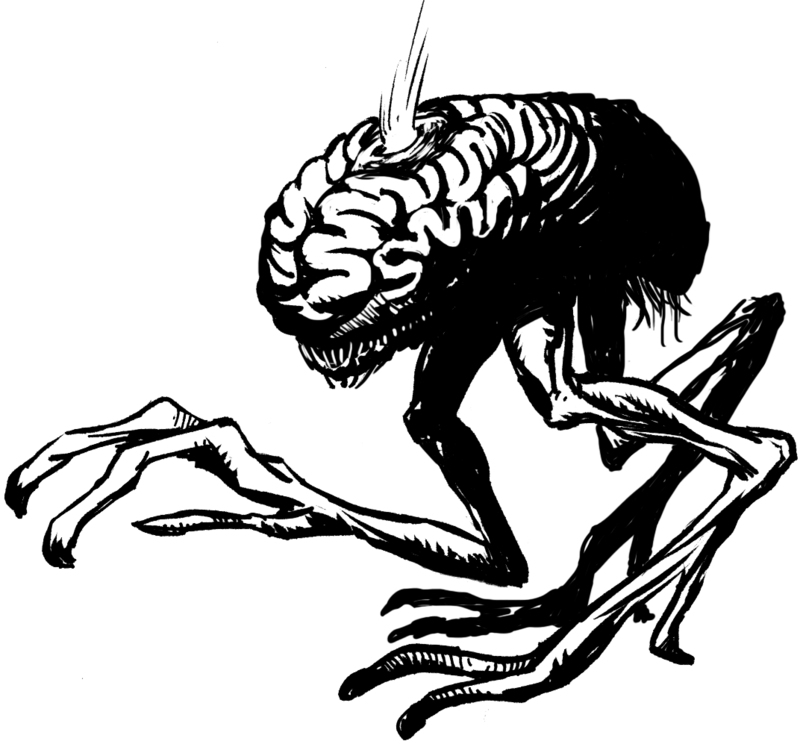 A disturbing new semi-undead monster for your OSR game, perfect for guarding the entrance to a catacomb, or ruined temple, or anyplace a graveyard may be found. It is whispered in secret places that if an innocent is beheaded in a graveyard on the night of the bloodmoon, then a black caterpillar will writhe from the victim’s neck and burrow into a grave. On the next bloodmoon, a bonecreeper will erupt from this graveyard. 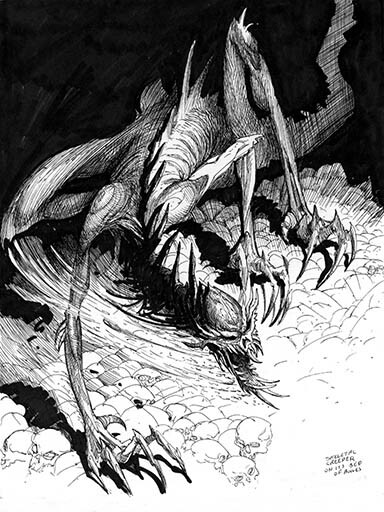 An undead beast roughly 20 feet in length, it has four clawed legs, a spiny serpentine body, and a bone demon’s face. The bonecreeper attacks with its sharp teeth, its claws, and its tail. Moreover, its carrion-hide and bone-spiked body emit a stench that causes all within 60 feet to suffer a -2 penalty to hit; a saving throw must be made each round to withstand the effect. Bonecreepers collect humanoid skulls, piles of which are found in their subterranean lairs. If a party facing this abomination offers a freshly (less than 12 hours old) severed humanoid head, the bonecreeper will accept the sacrifice and not attack the party for the next 24 hours. 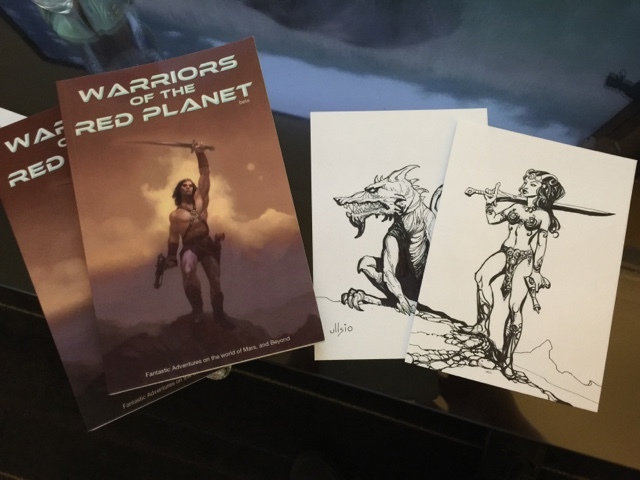 I'll be in Seattle at Emerald city comicon with some Warriors of the Red Planet goodies. Including post card packs of the art with randomly inserted original drawings! Stop by booth 2608. 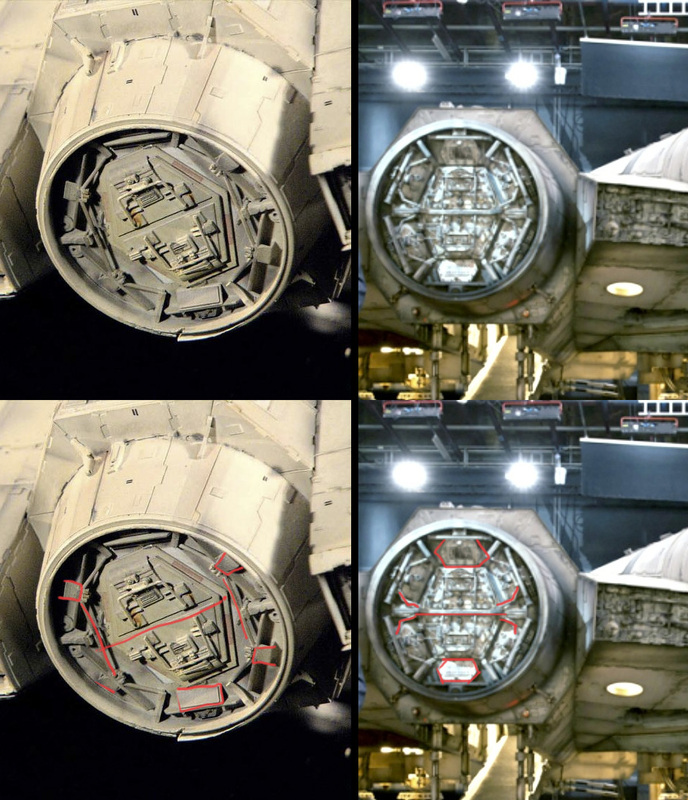 In general I've been trying to keep clear of the Star Wars 7 The Force Awakens rumors, but I was looking at some old shots of the models from the original Star Wars trilogy, when the image of the Millennium Falcon came up and I realized why something I'd seen from a leeked Episode 7 image didn't seem right. On the left is a shot from the original model, on the right is from the set of Episode 7. You can clearly see multiple differences, not just subtle, but obvious differences. I highlighted just a few in red. I'm sure everyone on 7 is working hard to get every detail right, but this is going to be a big, difficult thing to get everything right on.